I have tried multiple times with the mission Night alert (July 2 7.30PM) with the Union side but I just can not manage to win the battle. The Confederate troops are just too many and they beats me every time. What should I do? Your strategy tips is highly appreciated. Note that I play the Ipad version. Artillery is a key element to hold your positions. Protect artillery as long as possible. Use fortify to get bonuses for your infantry. Hope, that it will help. The great bonus to night battle is the enemy cannot see you till yo are right on top of them. Use this to your advantage. Mass your troops on one side or the other. Leaving only 1 or 2 brigades on the other side. Overwhelm the enemy before he can react. 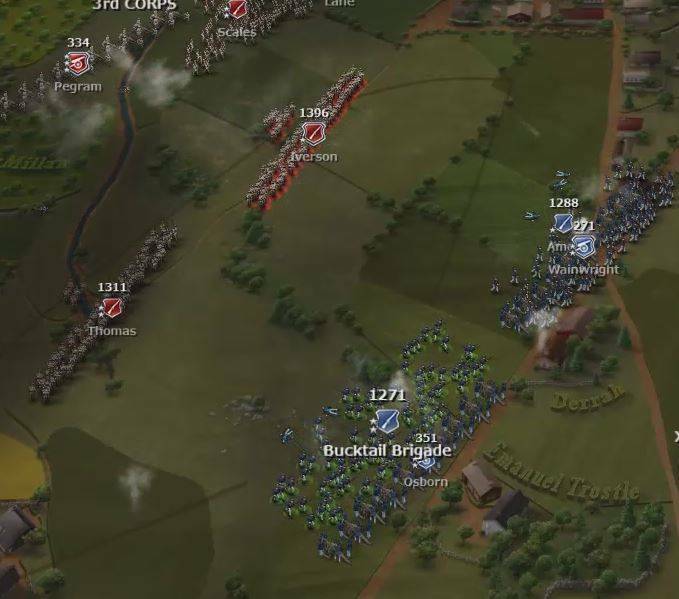 Target all your troops on one enemy rout them faster. Target the next keep the pressure and move forward. Repeat and if necessary relief the used infantry brigades with fresh ones. When you have the chance, attempt to destroy the enemy guns. 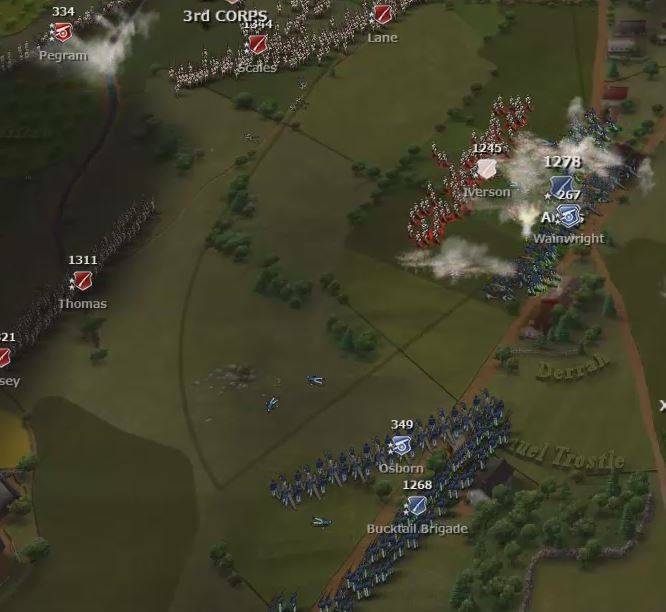 I tried to adpot Husserls tactics and it works ok the first half of the battle, but in the end the South army just has too many units with many stars. I just can not manage to hold the line. I try to regroup but I can find time enough to setup a new line and even if I did is seems as a Mount Everest to climd to take back the lost VPs. Me too. I'm either very stupid (read 'too old'), or... Oh I don't know, I've tried everything I can think of and so I guess I've just lost. Time to try to win as the confederates. I've been playing this scenario on 'Normal' difficulty on my iPad for a week ... And the result is always exactly the same. It doesn't matter what strategy I employ, the Confederate brigades invariably end up overwhelming and routing my Federal Army completely. I played once on 'Easy' difficulty, and I actually got destroyed even sooner. It's frustrating for two reasons: terrain and obstacles (stone fences, tree lines, etc.) don't seem to slow advancing troops down on either side. Plus, there is a propensity of certain Federal Corps units (Biddle, Ames, the Gibralter and Bucktail Brigades especially) to break ranks, and flee too readily and too far back of the front lines to be of much use as the battle progresses. Even the morale of the Generals doesn't seem to work very well. I had read that losses were supposed to be carried forward based on the entire campaign scenario: that isn't the case with the iPad version. In a previous battle, I absolutely crippled the Confederate Army and thoroughly destroyed Iverson and Pettigrew (ran them clear off the map) - yet both brigades returned to full strength for the July 2 7:30 pm Night Attack scenario. Obviously, Confederate dead had risen and become the Undead Rebel Zombie Hordes of Texas and Alabama. Regardless, it's a wee bit irksome. If anyone has a bugle-to-bugle strategy for defending Cemetary Ridge and Culp's Hill successfully in this scenario, I'd love to know it. I tried every tactic described above - in various combinations - and I give up. I feel like I purchased an iOS game with a Kobiyashi Maru: a no-win scenario. It doesn't matter what approach taken, the Confederates always react as if lines of sight, terrain, fences and artillery just doesn't matter. They overwhelm, both victory points, every single time. This doesn't instill a huge amount of faith in any future offerings in this series. Frankly, I'm so frustrated by this scenario that I feel like I wasted my time and my money on an RTS that normally I'd likely be raving about. Dear Developers: your July 2nd, 7:30 pm Night Attack scenario is ridiculously flawed and far from realistic. Soldiers do not go up hills and over trees and stone fences smoothly and quickly - least of all at the same speed as those defending hills behind obstacles. Please fix this! I want to play this game over and over again - but if it's impossible to proceed past this scenario (and I've tried for almost two weeks now), there's no point in continuing to play - or pay for future releases. Really, guys: make the terrain and the obstacles in the iOS version count for something and please patch this scenario. Please. We will patch game to decrease complexity of some of missions on easy level. That's lovely to know ... But 'complexity' isn't the problem. 'Realism' is a problem. Decreasing 'complexity' on easy levels won't persuade me (or likely anyone else) to pick up the game again. I'd be curious to know if anyone - except a developer - on the iPad version has ever actually beaten this scenario (Union side, for clarification). If so, please let us know? The Union lines never actually broke and fled from the high ground at Gettysburg in July, 1863. Not only do several brigades break ranks in the scenario, but they fall back too far to have any tangible further effect on the rest of the battle. In essence, once Biddle, Ames or the Gibralter Brigade flee the lines, the battle is absolutely not recoverable. This needs to be addressed. If there is a way to 'stiffen the resolve' of the Union brigades on the high ground, it should be done - at least to give a realistic feel to what actually happened in the real July 2 battle. After weeks of trying, I finally beat the Rebs on Night Alert (Normal). 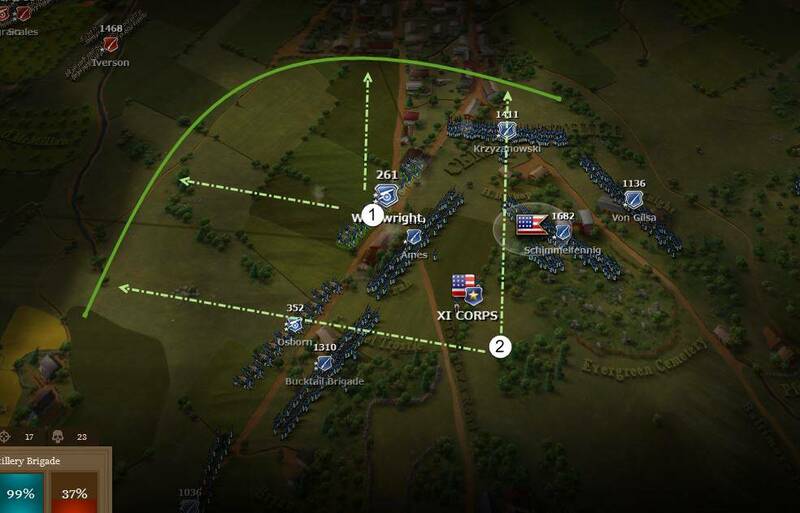 The basic strategy was to pull the arty back to the highest point of Cemetery Hill, push the infantry that is lined up on the center of Cemetery Hill initially forward slightly in front of the artillary and have them fortify their positions. 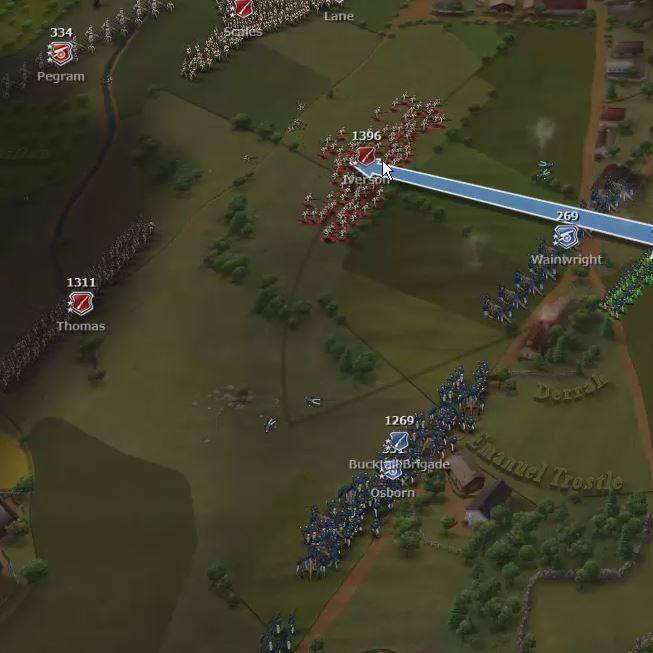 Move the infantry on the flanks of Cemetery Hill behind the front line of infantry and have them fortify. 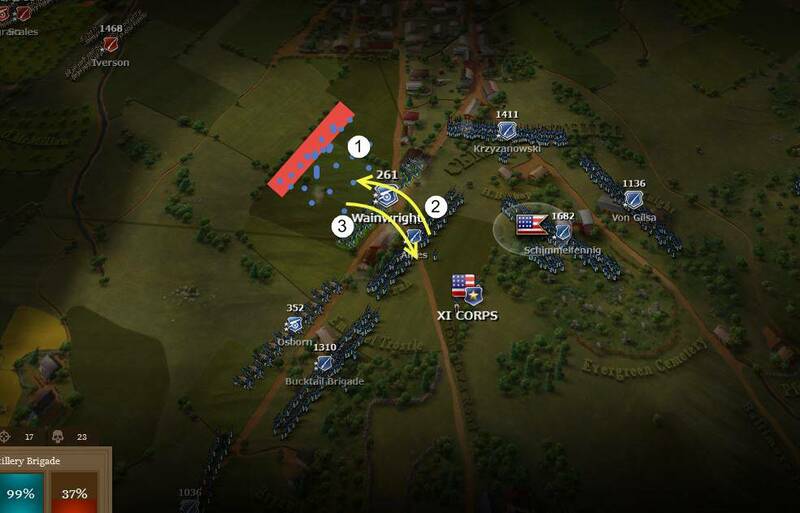 Pull the Iron Brigade off of Culp's Hill to help on Cemetery Hill, and reposition the other two brigades on Culp's so that they're guarding the victory point, and then have them dig in. Basically, always try to have two lines of fortified infantry in front of your arty on Cemetery Hill at all times. One line will break and fall back, but you'll already have a fortified row in place so that the Rebs can't rush your arty when that happens. When the first reinforcements arrive, send one brigade to the south flank of Cemetery Hill and one to the north flank, and have them plug whatever holes in your two-deep lines exist. Always have reinforcements run to get into place, but once they get where you need them, make sure to have them stop running and fortify. Once the Rebs appear to threaten Culp's, send one of your arty batteries to Culp's to assist in defense there. By the time the second wave of reinforcements arrive, they'll need to run to assist on Culp's - but you may want to have the smallest brigade (the one that arrives first) go to plug holes on Cemetery Hill, and have the larger two brigades run to get in place on Culp's to assist. Then just hold on for dear life. Always watch for brigades to break and fall back, and as soon as they reform, move them up into a second line of defense, and have them refortify. 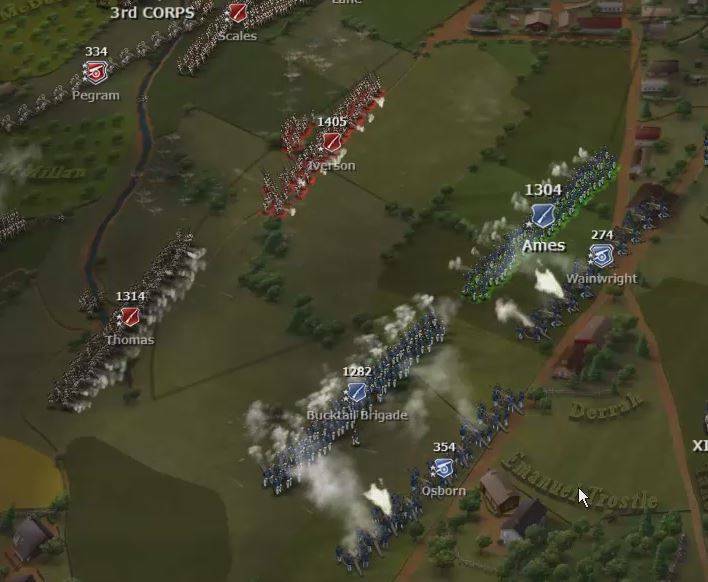 You may need to reposition the arty several times to give you room to form a second line of defense in front of them. Keep having brigades fortify whenever they get in line. It will still be very touch and go, and at the end you may have to send some brigades crashing into the Cemetery Hill victory point to keep the Rebs off it, but you will eventually hold it. I was seriously doubting it was possible to win this one, but it is. EDIT: On "Hard" - I'm not sure it's possible to win. The Confederates literally wiped my whole army off the map. Hello ! It's impossible to win Night Alert. Help me please... Thanks ! Hum, i finished the game both army long time ago but i get some difficultes making it again few days ago. I will try back night alert tonight before sleeping and will told you this week end if i succes or not into this mission. For a long time, I struggled to beat Night Alert on Easy defending the hilltop. Medium and Hard weren't doable at all. i thought it was bad design, that the Rebs were just too overpowered in this scenario, but I also wondered if I were overthinking it somehow. Went on that way for about a year -- three stars on every scenario except Night Alert. Basically, that's what happens when you do what Meade would do -- or what Meade would order you to do. It's not just you. Sitting on that hilltop waiting for the Rebs to push close enough to overrun you with a massed charge; if you execute flawlessly, you can squeak out a victory sometimes that way, but more often than not the Rebs will wipe you off the hilltops no matter how well you mix falling back with canister fire. And for what it's worth I think that's probably historically accurate when you look at how many Rebel brigades commit to the attack and their talents at melee combat. The very first time I went about it that way -- the best defense is a good offense -- I beat it on Hard, easily.